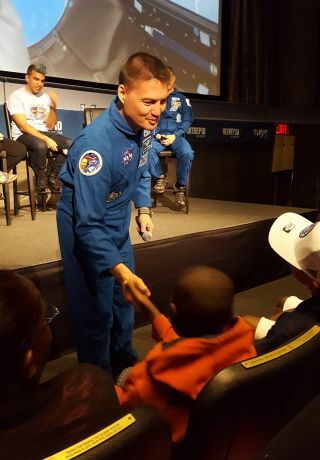 NASA astronaut Kjell Lindgren takes a moment to shake hands with young fans. What's the secret to becoming a successful scientist? Owning your curiosity. That's what Michelle Thaller, NASA's deputy director of science communications, told a roomful of people at the Intrepid Sea, Air and Space Museum earlier this month. She, NASA astronaut Kjell Lindgren, JAXA astronaut Soichi Noguchi and Jet Propulsion Laboratory (JPL) Systems engineer Bobak Ferdowsi gathered at the museum Saturday (Sept. 3) to talk about life on the International Space Station, the journey to Mars and the future of space exploration. "It was 1977, I was 7 years old, and I was walking out of the theater after I saw 'Star Wars,'" Thaller answered. "I thought, 'I have to do something to do with space.'" The other panelists had similar stories of inspiration through science fiction. Noguchi, who was among the crew on the first flight back into space after the Columbia disaster, explained how much it meant for him to see a character like Hikaru Sulu on "Star Trek." JAXA astronaut Soichi Noguchi talks about what seeing a Japanese character on the "Star Trek" crew meant to him. "I was really interested in the international flavor of the crew — they were mixed nationality, mixed gender. It gave me the possibility that the Japanese could someday take a flight to space," he said. Living aboard the space station certainly gives astronauts the same kind of international feel as the "Star Trek" crew. The station is an international laboratory, and crew from multiple countries who collaborate on experiments that further space exploration and — hopefully — someday allow us to land on Mars. "It's a demonstration of what we are able to do when we work together," Lindgren said. "When we go to Mars, I believe we should go there as humanity, not as a specific country." Those space station experiments, along with space missions like the New Horizons spacecraft that flew by Pluto last July and the Curiosity rover currently on Mars, also mimic "Star Trek" in the development of futuristic-seeming technology. "Some of the coolest tech right now is the stuff on the space station," Ferdowsi said. "Like the 3D printers, which definitely feel a little like replicators." Lindgren said he's looking forward to transporters, which instantly beamed characters from the show to other locations, but also agrees that 3D printers are an incredibly useful bit of tech to come from "Star Trek" imagination. "If something breaks on the space station, instead of having to ship it up there we could just print that part." Possibly the coolest "Star Trek"-like technology on the station (and on the ground), though, is the HoloLens. The HoloLens is essentially a small version of the "Star Trek" holodeck, and it uses augmented reality to let NASA officials "see" images of celestial bodies like Mars or Pluto as if they were right there. Thaller was lucky enough to have used the HoloLens during a meeting at JPL. "We have this Curiosity rover on Mars right now," she said. "If all around the world people put on these virtual-reality goggles, you could actually be standing right where Curiosity is on Mars. You will see an image of the ground and the hills and the landscape around you that was taken by the cameras on Curiosity." While it's definitely cool, a HoloLens is also the most efficient way to use Curiosity's time, Thaller said. It allows JPL scientists and engineers to see exactly where they should take the rover next. As one of the engineers on Curiosity, Ferdowsi said the day the rover landed was one of the most incredible moments he's witnessed working with NASA. Michelle Thaller, NASA science communicator, answers questions about Pluto after the panel. An emotional moment for Thaller — who admitted to being one of the NASA officials to demote Pluto from its planet status — was the surprising beauty of the dwarf planet found during the New Horizons flyby. "What we thought was going to be this dead, cold, isolated little place turned out to be so beautiful," she said. "It has active glaciers that are still flowing, mountains that are 12,000 feet high that are made of pure water ice, and hills that are actually floating on top of the glacier." The surprising Pluto terrain is making NASA rethink the idea of how the solar system formed and how planets work, Thaller said. Now, both Ferdowsi and Thaller say they're excited for even more surprises from space missions — like images from Juno spacecraft, which is doing a similar flyby around Jupiter. Noguchi said his "jaw-dropping moment" working in space exploration was the thought of new things about space that have yet to be discovered. "We (Japan) have upcoming asteroid missions and deep-space projects. We have Hubble. We have Chandra. There are still much better, jaw-dropping, goose-bumping moments," he said. "So, my young friends, don't worry — your time will come." Follow Kasandra Brabaw on Twitter @KassieBrabaw. Follow us @Spacedotcom, Facebook and Google+. Original article on Space.com .